You can’t keep a good man down. In the wake of Mike & Molly‘s cancellation, star Billy Gardell is getting schooled. High-schooled, that is. The actor, who played Mike Biggs on CBS‘s cancelled Mike & Molly will appear in the second part of Girl Meets World‘s two-night season premiere, TV Line reports. His episode airs June 5, 2016 at 8:30pm ET, on Disney Channel. Part one of the third season premiere airs June 3rd. According to the report, Gardell will play football coach Bobby Campagnola. The article also states Reginald VelJohnson (Family Matters‘ Carl Winslow) has been cast as a police officer in an upcoming episode of Girl Meets World. The Girl Meets World TV series cast includes Amir Mitchell-Townes, Peyton Meyer, Sabrina Carpenter, Cecilia Balagot, and Rowan Blanchard. Watch the new third season Girl Meets World main title sequence from Disney Channel. 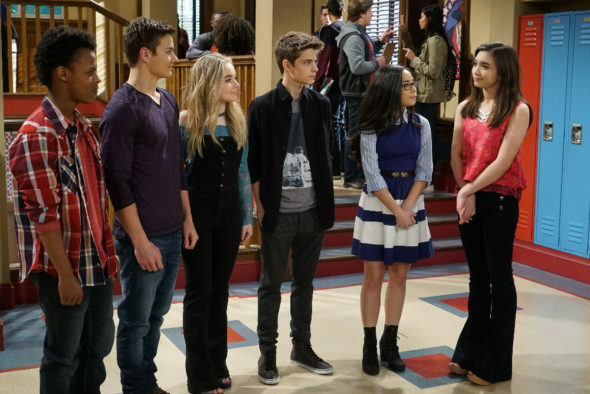 Here is a bonus Girl Meets World teaser, from Disney Channel. What do you think? Are you a fan of the Girl Meets World TV series? Do you plan to tune in for the third season premiere? More about: Girl Meets World, Girl Meets World: canceled or renewed?, Mike & Molly, Mike & Molly: canceled or renewed?